I purchased an Oyster card that can be used in Zones 1 to 3. How are the charges applied when I travel further from Zone 3 (let's say I'm traveling to a Zone 4 location), starting from a location in Zone 1? Does it only charge for the Zone 3 to Zone 4 or does it charge for the full journey from Zone 1 to Zone 4? If you have an Oyster with a valid travelcard for zones 1-3, and you travel outside those zones, you will pay an extension fare for only the zones that the travelcard doesn't cover. For zone 4, this should be the price for a trip within zone 4 only. If you went to zone 6, it would be the price for zone 4 to zone 6. Warning: if your Oyster card has no pay as you go balance, the extension fare payment can put your balance negative enough to stop you using it even within the zones you have a valid Travelcard for. By way of an example, for a through journey from East Croydon (zone 5) to Hatch End (zone 6) – a Z1-6 journey - with a zone 1-2 Travelcard, the relevant extension fare is through Z3-6 (£3.50 undiscounted Adult Peak – see attached spreadsheet). The zones of the extension fare reflect the zones of the journeys not covered by the Travelcard. So special extension fares for this situation exist. They're not easy to find on the TfL website, but the FoI answer linked above contains a spreadsheet showing what they were in 2016. There are hundreds of individually set extension fares (presumably quoted in pence!) depending on which zones you need and whether you use tube, National Rail, or both -- and if they follow from any simpler formula, that hasn't been disclosed. You have to pay for all of the zones that your travelcard does not cover, but only for the zones that are not covered. So if you travel from Z3 to Z4, then you have to pay for the cost of the Z4 trip only. You also don't need to pay twice if you cross zone boundaries multiple times, so if you travel from Z4 from one end of the city, through Z1-3 to a Z4 station on the other side (for example Norwood Junction to Wembley Park), you still only have to pay one single Z4 extension. Is the Z4 station on the TFL fare zone (which includes London Overground, Underground, DLR and a lot of National Rail services in Z1), on the TFL Rail fare zone (most rail services in the northeast), or on the National Rail fare zone (most rail services in the south). I added a map where the red and dark-red lines (named "NR1 scale") show the routes where National Rail fares apply, and the pink ones, where the TFL Rail fares apply. 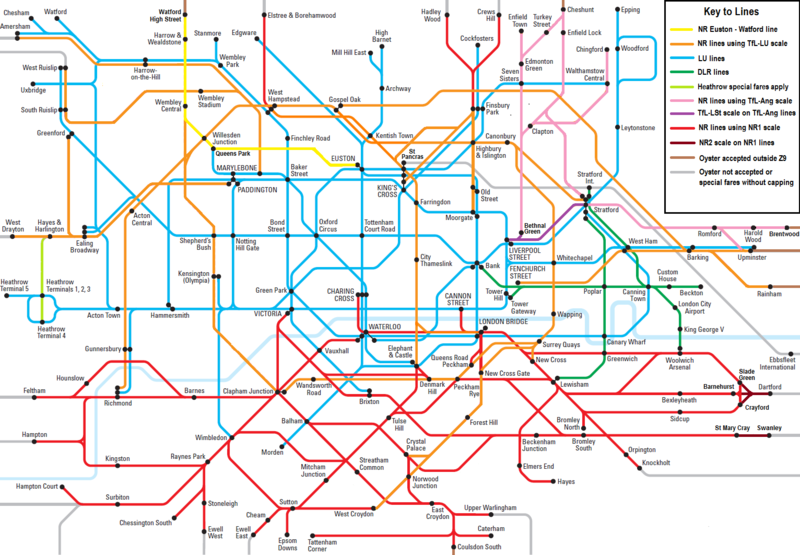 NR1 routes are usually more expensive both off peak and peak than comparable London Underground routes. These routes include are almost all rail routes south of the Thames, and a few in the northern parts of the city. TFL Rail fares are slightly more expensive off-peak than the comparable London Underground fares, but are the same during peak times. These routes are predominantly in the northeastern part of the city. Also if your travelcard does not cover Z1, but you use both London Underground and NR1 routes (see the red routes on the map below), then you'll also need to pay the LU/NR1 extension charge. If your travelcard covers Z1, then you won't need to worry about it, even if you use both LU and NR1 routes outside your covered zones(3). There is also no extension charge when using TFL Rail routes. (1) If you start your journey in peak times, but by the time you would enter the zones not covered by your travelcard it would be after peak times you could exit and re-enter the station within Z3 for example. If the re-enter time is already off-peak then you will pay less for the Z4 trip. (2) During the weekday afternoon peak period any trip that starts outside Z1 and finishes inside Z1 (for example a Z4->Z1 trip) is considered an off-peak travel. Any other combination (e.g. doing a Z4->Z2 trip, a Z1->Z1 trip, or a Z2->Z2 trip where you cross Z1) is still considered a peak travel. This only applies to the afternoon, all trips in the morning peak period are peak ones. (3) There is one weird exception: if your travelcard covers for example Z2-5, and you use both LU and NR1 routes, but you switch between LU and NR1 on the boundaries of Z1/2 (for example at Elephant and Castle), then you won't need to pay this extension fare. Not the answer you're looking for? Browse other questions tagged london fees-and-charges tfl or ask your own question. Travelling in London: Oyster card or Travelcard?